You are here: Home › Blog › Unplanned Pregnancy: Abortion or Adoption? In light of New York’s new law allowing abortion at any time up to the birth of the child, I’m more thankful than ever to work in a place that gives women another option, and their babies the chance to live. An unplanned pregnancy doesn’t have to be the end. An unplanned pregnancy doesn’t have to mean you’re “stuck” raising a child you are not prepared, ready, or able to raise. There is pregnancy help available. If NY’s new law horrifies you as much as it does me, PLEASE do more than talk about how wrong it is. Find ways to help be part of a better solution. Go pray outside abortion centers for people going inside. 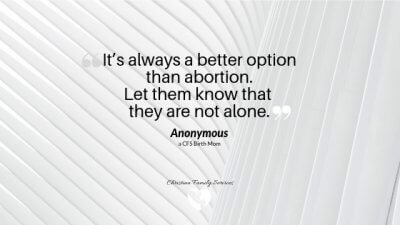 Volunteer your time or donate items and/or money to your local pregnancy centers who are fighting everyday to help pregnant, abortion minded women choose a better option that results in life. Pregnancy centers provide counseling and support to women who often have none and feel all alone. They provide maternity clothes, baby items and counseling well after the birth of the child. They provide real, factual information on abortion procedures and the physical, mental and emotional effects it often causes, dire effects anyone claiming abortion is about women’s health SHOULD be educating women on. They provide free pregnancy tests, ultrasounds, and STI testing. Unlike abortion clinics, women actually get to hear their baby’s heartbeat and SEE they have a living baby inside them, not just a mass of tissue. They also often provide post-abortion counseling to the countless women who have come to regret their decision to abort. You can also become an adoptive parent. You can be that parent a mom needs and is looking for to raise her child, when the most she can currently do for him/her is grant the gift of life. Or you can volunteer or donate to an adoption agency, who, like pregnancy centers, is fighting to give women another, better option. An agency who provides housing, transportation, and access to medical care so she and baby are healthy. An agency who provides ongoing support and counseling to help her through her grief and navigate her new role as a birth mother, as well as helps her get on her feet, prepare and assist in her future goals. At the very least, learn more about how adoption actually works, how it’s changed. Learn how placing a baby for adoption is different than giving baby up for adoption. Learn how an expectant mother can still have a relationship with their child if she chooses open adoption. Learn how this relationship is a blessing to the adoptive family, most importantly the child, and NOT something adoptive parents need to fear. Yes, you can and should share news about what’s happening. However, sharing is not enough. These precious babies need us to do more.